Raith Rovers manager John McGlynn has spoken of his delight after top scorer Kevin Nisbet signed a one-year contract extension. 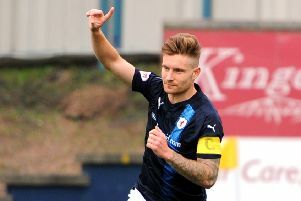 The striker has committed himself to the Stark's Park club until May 2020, having struck 18 times in 21 appearances since joining in the summer following his release from Partick Thistle. With his initial one-year contract due to run out at the end of the current season, the club has been keen to get its main marksman tied down early, and McGlynn is thrilled the 21-year-old has agreed terms. "He's the top goalscorer over all the leagues so it's speaks volumes for the club to have someone like him in our team, and to extend his contract is fantastic news," he said. "I'm sure the fans will be delighted that we're managing to keep hold of Kevin and the potential he has. "Although he's been flying, I still feel there's a lot more to come from him. "Seeing what he's got in his locker - he's an all-round striker, he's not just a goalscorer. "His movement is good and it's actually getting better. "His goal-scoring, awareness and first touch are all excellent. "He's got a lot going for him, and I think there's a bright future ahead for Kevin."